The living room is the heart of the home. Some will tell you that the kitchen is the most important room in the house (it’s certainly the most practical). But it’s the living room that has a warm and friendly atmosphere. The living room is the place to relax, unwind, and enjoy time together as a family. It’s worth spending some time upgrading it, especially if you’ve neglected it for a while. In this post, we’re looking at a series of super simple upgrades you can do this weekend. 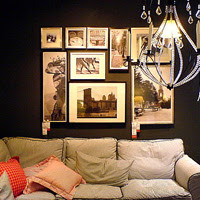 Each one will improve the comfort and aesthetic of your favourite room. Here we go. It’s such a simple upgrade, but it works wonders. A lick of paint can alter the entire feel and ambience of a room. If you’re looking for a warm and cosy atmosphere, try a deep, rich colour. Something bold like a dark red or deep blue will bring warmth to the room. If that seems a little overbearing, try just one accent wall. It’s an easy way to add character and personality to your living room. The furniture in your home is often what gives it character and personality. A lot of families tend to stick to practical, safe flat pack furniture. Those Ikea basics certainly are useful. But, they’re not exactly adding much character to the home. For that, you’ll need some unique items. You could try something different, like vintage industrial furniture. Vintage furniture often has a lot more personality. If you’re wondering why your living room feels a little flat, it might be the walls. We often forget about the wall space, but it’s the perfect place to express your personality! By choosing your favourite pieces of art, you can create a space that feels like home. It needn’t be expensive either. Take a look around your local art galleries and shops. You’re bound to find a local artist you’d never heard of. There’s a lot you can do with just a few simple lighting tricks. In fact, lighting can alter the entire feel and vibe of a space. Try to avoid harsh overhead lights. Instead, install a dimmer switch, and place lots of smaller task lights around the room. Lamps are perfect here. You can go one step further and use candles for those colder winter nights! When it comes to the living room, one of the best things you can do is build up textures. The more layers you create, the more homely and cosy it feels. You can do this with lots of soft furnishings. A large central rug is the best way make a big impact. You can use this to inject lots of colour and texture into the room. Lastly, you can put your own stamp on the room by choosing personal and unique accessories. Fill the room with some of your favourite personal items. Raid your attic for old possessions, and get creative! The living room should be a cosy and warm space, especially as the winter nights draw in. Try these tricks in your own home.